Upon receiving YallaLearn Write & Wipe Arabic Letter & Numbers Activity Book, from YallaKids, we were delighted by the professional nature of this product's layout, oozing both quality and exuding a 'come and explore' feel to it. 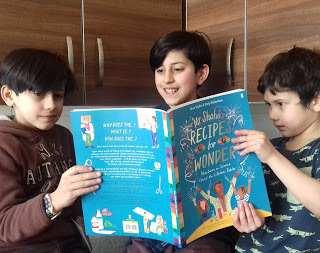 This spiral-bound A4 book was an instant hit with all the kiddies, who couldn't wait to try it out! 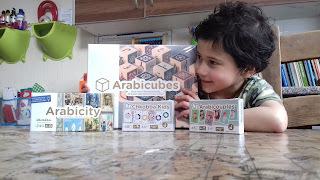 Beautifully illustrated images with eye-catching vibrant colours, YallaKids have developed and designed a practical and exciting product. 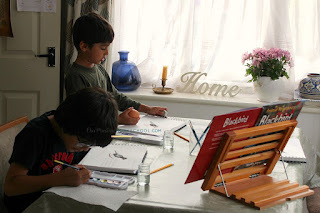 DD3 did just as the book suggests by grabbing the pen and hasn't put it down since. 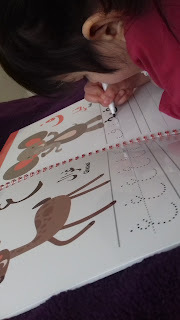 She carefully traced the letters using the dot to dot method and then independently set out to write the letters herself, all the while repeatedly chanting the letters aloud. After completing the page, DS11 read the word out to her which she repeated. 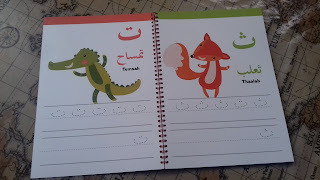 Within minutes of using the book DD3 has learnt the Arabic words for the first two animals. 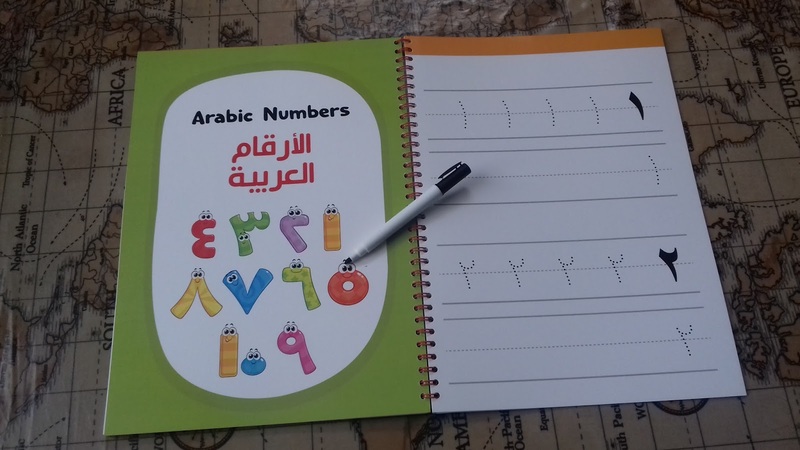 This series is going to be such an exciting journey, not only will it help the kiddies with their Arabic writing skills, but it will steadily increase their vocabulary along the way! 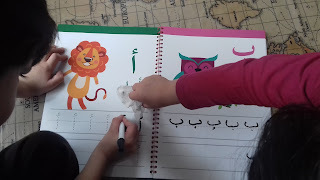 DD3 and DD6 have both been learning to read Arabic letters and join up words. 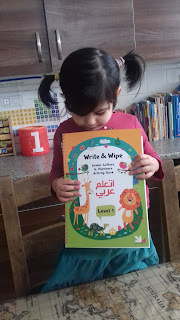 Writing comes later, just like in the English Language, but this book is a great start to beginning to learn to write from right to left, developing their fine motor skills and pen control along the way. Being able to wipe the letter and start again really is a great feature of this book, just in case they make a mistake or want to perfect their letters like DD3! 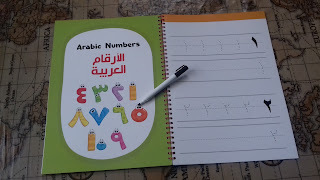 The Arabic number section at the back is like a great little bonus section which has been added. DD3 had fun singing the Arabic number song whilst learning to write each one. 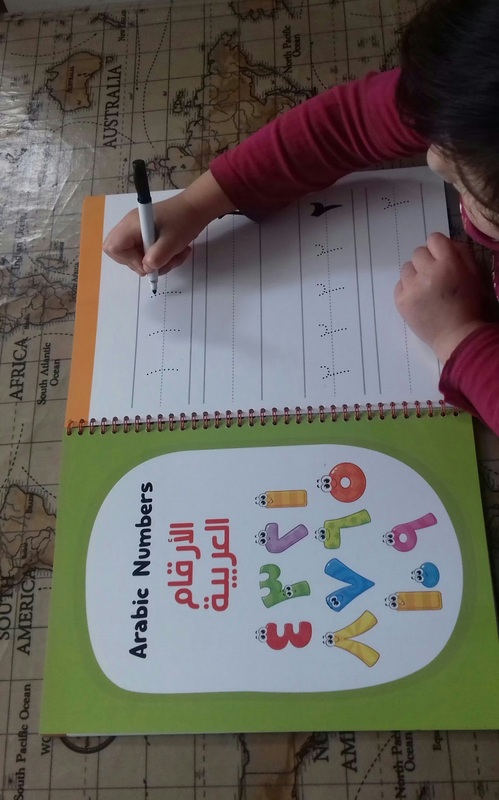 After using this book from YallaKids in our Home Ed classroom, DD3 sneaked off to her room for more practise! 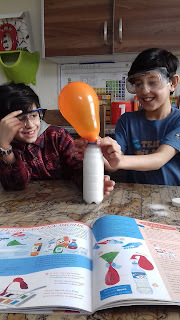 I love it when the kiddies enjoy their learning and using educational resources like this, make lessons more exciting and stimulating, prolonging their attention span and making learning fun! To get your hands on the first of many exciting new products from Yalla Learn, click here.